Looking west from eastern end. New plantings, mid way, January 2009. Looking east from western end. This is the area to the southern side of the path between the smaller house and the southern boundary, where the central terrace drops down towards the lower one. 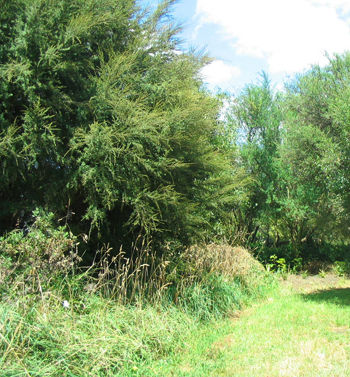 It has a large number of native trees, some planted recently (2009) and others in the 1990s. The native plants here are orihau (Pseudopanax colensoi); karaka (Corynocarpus laevigata -- 4, along the boundary); kanuka (Kunzea ericoides -- 6 quite large trees), manuka (Leptospermum scoparium -- 2); (Pseudopanax lessonii -- 2 newly planted); totara (Podocarpus totara); puriri, a.k.a. 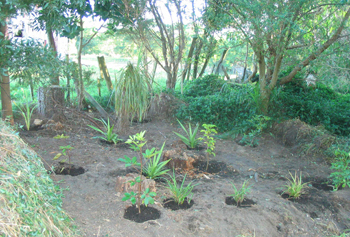 kauere (Vitex lucens -- 1 large older tree, and 1 newly planted); the groundcover Dianella nigra; two varieties of tï (Cordyline banksii -- tï ngahere, newly planted,and tï kouka -- C. australis); Ngaio (Myoporum laetum); harakeke (Phormium tenax); puahou or whau (Pseudopanax arboreus - 2 newly planted), and several whara (Astelia grandis). The exotic trees, all well-established, include 4 Tasmanian blackwoods, several tagasaste (used initially as nurse trees and gradually dying or being removed), an olive, a pepper tree and a camellia. At present (February 2009) there are also many weeds waiting to be eradicated, including the invasive groundcover Tradescantia, a dreadful pest which has found its way into part of this area. You can see mounds of it piled up on each side of the new plantings in the photograph to the left. 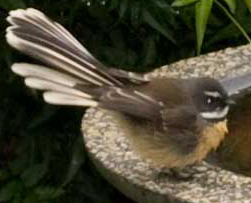 The slim sapling in the centre of that photograph is a kauere (puriri) tree -- the tall puriri on the edge of the slope to the west of it can clearly be seen left of centre in the bottom photograph. 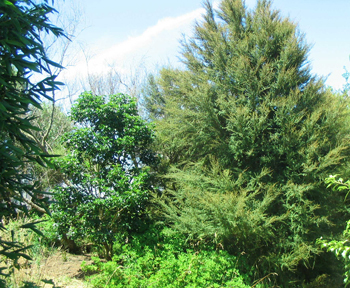 The large, feathery trees are kanuka (Kunzea ericoides).